Boasting flared arms and a luxuriously deep seat cushion, the Jasmine armchair will make for an elegant addition to your living room. Built with exceptional quality in mind, the armchair is built with specialty seats meaning there’s no need to turn to keep them in shape. A high-density foam and rolled carded fibre filling ensure that the cushions retain their plump shape while also bringing a luxury feel to your living room. The cushions are upholstered in sumptuously soft fabric. 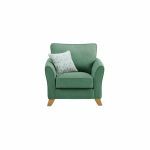 You can even enjoy a completed look thanks to the complementary geometric cushion which perfectly contrasts the chair, and features a plain reversible back too, so you can change your living room style on a whim. Create a coordinated look by pairing it with a matching sofa from the Jasmine range.